Explore apple colors with this simple decorative craft. 1. Gather your material. 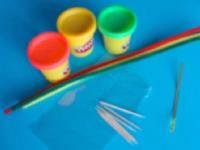 You will need three pipe cleaners (a red one, a green one, and a yellow one), yellow, green, and red modeling dough, a small plastic bag (for homemade lollipops), a metallic garbage bag fastener, and toothpicks. 2. 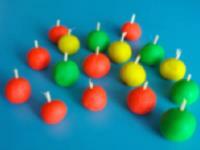 Use the modeling dough to make several small balls to represent red, green, and yellow apples. Break the toothpicks into tiny pieces and insert one piece in each small apple to represent peduncles. Leave the apples out to dry until they are hard. 3. Insert the apples in the small plastic bag. Name the color of each apple before adding it to the bag or name a color and encourage the child to add an apple of the corresponding color to the bag. Of course, you may also choose to count the apples. 4. 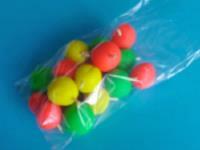 Use the fastener to close your bag of miniature apples. At this stage, you may choose to deposit your bag of apples in your kitchen area to use it for role play. 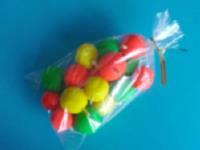 Children will love to pretend to use the apples to bake apple pies and so much more. 5. 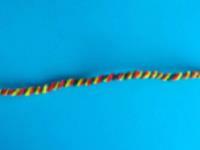 Twist the pipe cleaners together, making sure children notice the pipe cleaners are red, green, and yellow, just like apples. 6. 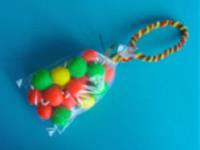 Use the twisted pipe cleaners to create a loop and twist it around the top of your bag of apples. Hang the bag of apples from the ceiling as a decoration for your apple or apple orchard theme. 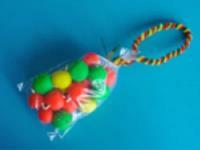 Make several and use them to create a colourful garland.